South Africa coach Peter de Villiers has hailed the importance of experience ahead of his side's attempt to seal the Tri-Nations against Australia in Brisbane on Saturday. The Springboks will tackle the Wallabies with an impressive 624 international caps on the field and a further 209 on the bench. The game at the Suncorp Stadium will also mark the 50th Test appearance for centre Jaque Fourie - the fifth player after Schalk Burger, Bryan Habana, Jean de Villiers and Fourie du Preez to reach the milestone in 2009. 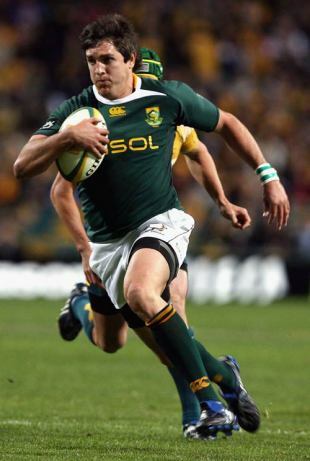 "On Saturday, Jaque Fourie will become the fifth player this season to earn his 50th cap in the green and gold," the coach wrote in his column on sarugby.co.za. "This is a wonderful milestone and it is certainly something to celebrate. "Another major achievement a few weeks ago was that of (captain) John Smit who became the most capped Test captain of all time when we faced the All Blacks in Durban. What has amazed me as we have marked these milestones has been the unselfishness of the players in ensuring that the team's interests always come first." South Africa are just one win away from winning the Tri-Nations title for the first time since 2004 after two victories each over New Zealand and the Wallabies in the 2009 edition. De Villiers also praised the humility of his squad, who have lost just one Test this year - against the British and Irish Lions - out of the seven played, saying they had the potential to achieve even greater things. "It is a credit to all of them that, despite the magnitude of what they had achieved, the team performance and getting the result has taken priority. All of these players have been humble in receiving the accolades due to them and they have set an example for others who will one day reach similar heights in future. "What is more exciting is that we now have nine players in our match 22 who have 50 caps or more. And these are players who have a few more good years of top-class rugby left in them! What a wonderful position to be in. "There are some in this group who are slowly but surely creeping up to the half-century mark and others who are just starting out but have already shown the capacity to go on to greater things. All in all we have a strong, well-balanced squad that is experienced, has great leaders and is playing with confidence and self-belief." Looking ahead to the match in Brisbane, where the Springboks have not won in six attempts since their reinstatement in 1992, he added: "We have not won the title yet and there are still two tough games to play. We are focusing on the immediate task at hand and that is to do well against Australia on Saturday." Australia hold the record for the most Test experience in a starting line-up having fielded 798 caps against Japan at Rugby World Cup 2007.